Give your lessons a dynamic learning upgrade with my dynamic lesson makeovers for your classroom! If you’re not sure what dynamic learning is, I recommend going back and starting with episode 1 of the podcast. This is episode four of a five-part series on meaningful technology integration, and I’d love for you to benefit from listening to the whole series in order! Throughout the series, I’ve been giving you some examples of how to make learning dynamic. Today’s episode is all about concrete examples of taking static assignments and shifting them into more dynamic lessons. I’ll cover five more examples like this throughout today’s episode, but I can’t resist sharing one more now! Think of how much more powerful it would be for your students if, instead of writing a biography on one historical figure, they created a public class website on inspiring historical figures. And, instead of handing in a paper and being done, they can add additional content throughout the year and publish it for a global audience. They’re still getting practice in research and writing, but now they’re building something throughout the year. If I sound particularly excited and enthusiastic about this idea, it’s because I am! Taking learning “beyond,” as we covered in a previous episode, makes it so much more powerful for students. I hope that these dynamic lesson makeovers, as well as the others that I talk about in the episode, are already giving you ideas on how to transform your lesson plans and bring more dynamic learning into your classroom. [00:28] - Welcome to the show! Kasey introduces today’s topic: dynamic lesson makeovers for your classroom. [01:56] - Today’s shoutout goes to Levi Thomas, Rebecca Brewer, and Stacy Larsen, who are recent graduates of Kasey’s Google Certified Educator Academy (Level 1). They all recently passed their exams and became Google Certified! [02:43] - Ready to dive into the featured content? Kasey begins exploring today’s topic. [04:08] - Kasey explains that this particular podcast started off as part of a blog post and presentation that she has shared. [05:42] - Kasey starts by talking about the “not that” side of her “do this, not that” infographic. We learn about an option for what to do instead of a research paper on World War II. [07:24] - We learn about how this option aligns with the dynamic learning framework that Kasey explored in episode 3. [08:25] - The next example that Kasey provides is a dynamic substitute for an Edgar Allan Poe author study worksheet packet. [10:55] - Kasey moves on to the next lesson makeover: labeling and coloring a paper map of the capitals of the United States. [12:20] - We learn about a powerful tool from Google: Google Earth Tour Builder. [13:05] - Kasey shares a lesson makeover that turns a written biography of Winston Churchill into a public class website, which is updated with additional content throughout the year, on inspiring historical figures. [14:57] - The next of Kasey’s lesson plan makeovers is about science fair projects, she explains. [16:47] - Kasey talks about how to use technology in the classroom for math teachers. [20:01] - We jump to another idea: the static worksheet about the scientific method. [23:10] - Kasey hopes you’ve enjoyed these examples on how to take lesson plans from static to dynamic! [23:40] - We hear about some simple ways that you can upgrade your lessons. [25:47] - Kasey talks about the power of having students set their own learning goals. [27:22] - What are some ways that you can give some of your lessons a dynamic learning upgrade? Kasey offers questions for listeners to consider, then mentions an opportunity to be on the podcast. [29:14] - Don’t forget that this episode is part of a series! The series comes with an Epic Download Freebie. [30:30] - Here’s this episode’s podcast question: what is one dynamic learning upgrade that you are willing to try in your classroom? Please share the answer on your favorite social platform using the #shakeuplearning hashtag, or post your answer in the Shake Up Learning community! [31:19] - Kasey challenges listeners to download the freebie and share this episode with at least one other teacher. She also invites listeners to join the Shake Up Learning Book Study. 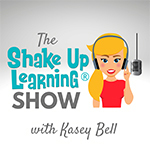 [32:14] - Shake Up Learning offers several professional development courses for teachers! See all Shake Up Learning courses at this link, or check them out individually: The Google Classroom Master Class, The Google Slides Master Class, The Dynamic Learning Workshop, and Google Certification Courses. [35:38] - This show is brand new, and it would be really helpful if you leave a review! Bonus points if you fit the word y’all into your review.